New Holland 's new T7070 Auto Command tractor has been awarded the prestigious title of 'Tractor of the Year' for 2010 at Agritechnica, the European show for agricultural machinery and equipment that recently took place in Germany. The T7000 Auto Command tractor with continuous variable transmission was also given the 'Golden Tractor for Design' award, which recognizes design excellence focusing on ease of use and operator comfort. This pair of awards for the T7070 Auto Command tractor compliments the reception of the same awards for 2008 by the T7060 Power Command at the 2007 Agritechnica, making the T7000 Series the most awarded line of tractors in the 13 year history of the award. The Agritechnica 'Tractor of the Year' award is given to the open field model that combines all the benefits of innovation, productivity, comfort, economy and ease of use, all of which are necessary for a leading tractor in modern farming. For the T7070 Auto Command tractor, this title recognizes the teamwork that has not only been made by New Holland Agriculture and by the entire Fiat Group, but also by the customers who have contributed to its development with their input. The five tractors in the T7000 Auto Command Series are powered by a new NEF engine, with between 167 and 225hp that can run on 100% Biodiesel and developed by Fiat Powertrain Technologies of Turin, Italy. The new generation Auto Command continuously variable transmission was developed at the New Holland Research Centre of Modena, Italy, and is manufactured in the Antwerp plant in Belgium. The Fiat Style Centre in Turin played a key role in the tractor's ergonomic design and the styling of the new SideWinder II console, which allowed the T7070 Auto Command to obtain the "Golden Tractor for Design" award. The SideWinder II console features the CommandGrip control lever and a monitor with Intelliview III touchscreen display. This is the first monitor available on the market which integrates the tractor and implement controls, as well as the auto guidance system. Don Forrester New Holland Product Performance Manager, ANZ today said, " New Holland is proud to continually challenge the mould, coming up with smarter more advanced ways to benefit its customers. 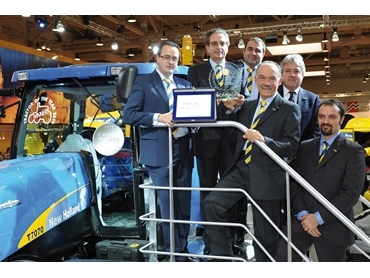 Winning the 2010 awards at Agritechnica is yet another example of how New Holland is leading the way in its field".